Established in 1989, the Adaptive Physical Education Program, previously sponsored by Cañada College for over twenty years, was eliminated in June 2010 due to the state budget crisis. With the on-going support of the Sequoia Healthcare District, Kaiser Permanente, the Palo Alto Medical Foundation, the West Valley Federated Women's Club, the Easter Cross Association, and the Redwood City Veterans Memorial Senior Center, this program has been able to continue its services to the aging population wishing to be more active. In 2015, the program became a non-profit 501(c)(3) charitable organization. Adaptive Physical Education is a fitness and wellness program designed for adults of all ability levels, particularly seniors and boomers, with physical disabilities or health limitations. Our goal is to improve and maintain the health and well-being of adults who wish to remain independent in their lives. We do this in a comfortable, community setting by making improvements in cardiovascular fitness, strength, flexibility, balance and coordination along with a special emphasis on fall prevention. Scott Lohmann has taught Adaptive PE since 2002. His interests in the field started in 1990 when he was a student at the College of San Mateo in the Adaptive PE program. He started as a volunteer and realized teaching was his passion. Scott graduated from San Francisco State University with a B.A. in Kinesiology emphasizing Adaptive PE. He also received his Masters in Gerontology focusing on Fitness and Aging. Scott has taught in the California Community Colleges of San Mateo, Cañada, and Foothill College. He works with groups of all ages and enjoys the challenges of working with individuals who have multiple mobility and physical limitations. He is also a personal trainer outside of Adaptive PE. In addition to teaching in the Adaptive PE Program, he also teaches classes for the City of Redwood City. Classes include Weight Training, General Conditioning, and Evening Fitness for the mentally disabled on Tuesday nights. Scott has a strong passion for fitness and enjoys watching his students and clients make steady progress over time. When Scott is not teaching he enjoys lifting heavy weights in the gym, pushing himself harder with every passing day. He also has a passion for music and racing Corvettes. "I believe we should follow all of our passions even if there is more than 1! Or 2 or 3." Barbara graduated from San Francisco State University with Bachelors and Masters Degrees in Adaptive Physical Education, along with a certificate in Kinesiotherapy from San Jose State. She also holds an Exercise is Medicine Level 1 Credential from the American College of Sports Medicine (ACSM), and a certificate from the American Council on Exercise (ACE). 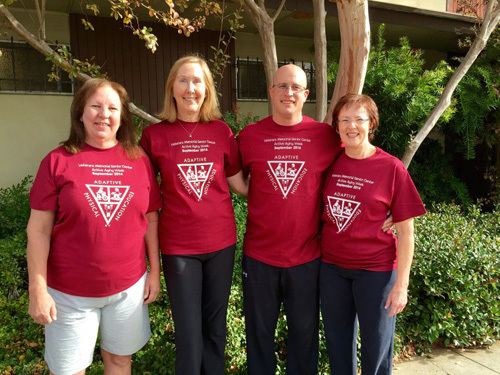 She started working in 1977 as an assistant in the Foothill College Adaptive P.E. program which was located at the Veterans Hospital in Palo Alto. In 1981, Barbara became the full-time Adaptive P.E. instructor at Cañada College. In 1989, the program expanded its classroom space into the Veterans Memorial Senior Center to meet the growing need in the community. In May, 2010, after 29 years, Barbara retired from the College and has continued to offer this program, as both Program Manager and instructor, with the support of the VMSC, the Sequoia Healthcare District, and other community agencies. Barbara believes that fitness and movement are necessary components of daily life. She has derived great satisfaction from working with individuals who have no other opportunities for participating in an assisted exercise program. She enjoys the challenge of "adapting" a piece of equipment, or a special exercise, to meet each person's unique needs, as well as helping to set the scene where a diversity of people can come together in a supportive environment. Barbara is personally inspired by the many individuals who come through our doors each day! Susan specializes in working with seniors with balance/stability issues. She loves working with clients to improve their quality of life. Susan has a B. S. in Design from UC Davis and is a graduate of the Cañada College Fitness Professional Program. She is certified by ACE - American Council on Exercise. Susan is responsible for developing and implementing new programs that align with the Adaptive PE mission statement, as well as writing grant proposals and reports. She plans our annual health fair, Active Aging Week. She and her husband have five grown children. Patti, a long-time resident of Redwood City, began her working career as a truck driver. In 1999 Patti’s life changed dramatically when her husband Wes had a stroke. In the years following she worked closely with the physical and occupational therapists to help rehabilitate him. It was during that time that she learned about an Adaptive P.E. program run through Cañada College and enrolled him. While Wes was attending class, Patti volunteered part-time which eventually led to her working full-time as Barbara’s assistant. She has been there ever since! Patti truly enjoys working with the students in the program to help them reach their fitness and wellness goals. Her personal experience has made her more compassionate to the struggles of both the participant and their family members. Integrating mind and body awareness is the goal for Ruth as a yoga teacher and practitioner. Ruth's practice began on the shores of the Big Island of Hawaii, and has been a steady force in her life ever since. A graduate of Doron Yoga Teacher Training, Ruth focuses on the practice of opening up hearts to the beauty to be found in each day, and in every situation. Combining the mindfulness training from her clinical social work practice, adding in the breath and asana of a true yoga union, Ruth designs her classes with the awareness of the changing needs of our bodies, throughout the day, the season, and our lifetimes. Classes with Ruth are taught in the vinyasa style; students can expect to be challenged, motivated, nurtured, and encouraged to develop a personal practice that resonates both on and off the mat. Her hope is that a student arrives to class open to the yoga experience, and leaves feeling well, energized and prepared for the challenges that life outside the studio presents. When not on the yoga mat, Ruth finds joy in hiking, cooking, and in her practice of clinical social work. Learn more about Ruth's Yoga practice at www.ruthwestyoga.com. Arlene is a board certified neurologic physical therapist and yoga instructor with extensive experience as a clinician, leader, educator, consultant and mentor. Arlene has a holistic and compassionate philosophy and seeks to spark in others the joy and passion within. She has studied compassion at the Stanford Compassion Care Institute and continues studying Self- Compassion with the Center for Mindful Self-Compassion. Her Yoga teaching has focused on bringing the joy of mindful movement and breath to those with physical disabilities so that they can experience calm, peace and equanimity. She is currently working towards a 500-hour yoga teacher training certificate to broaden her knowledge of yoga. For fun she studies French. Sang has been training with kettlebells since 2010. Shortly after, she moved to personal training after learning movement from her kettlebell group. She started out in Adaptive P.E. as a volunteer in the Parkinson’s exercise class. From there she added Evening Weight Loss on Mondays, co-instructs a Parkinson’s exercise class on Wednesdays and teaches a Level II circuit class on Thursdays. Outside of Adaptive P.E. Sang works at a chiropractic clinic doing mostly corrective exercise to help patients get stronger not only in activities of daily living, but also sport related fitness like cycling, golf, and tennis. She also does training at corporate gyms and in home. Sang holds certifications with the American Council on Exercise (ACE), Dragon Door Russian Kettlebell, Tabata Bootcamp, Strong First Barbell, Yoga Tune Up Ball Rolling, Functional Range Conditioning and Stick Mobility. She also has training in Eric Franklin for Sport, Yoga Tune Up, Sandbags and Primal Movements. Sang has had an interest in allied health since high school and college. However, her degree is in Consumer Science and Merchandising with a minor in Industrial Supervision. Angie Ibarra has been dancing since she was a child and is a Zumba certified instructor since 2009. She is known for her high energy, passion and love for her students and community. You can find her during the week working with children and families as she leads a non-profit and on the weekends dancing salsa (all in Redwood City)! Mondays have become a favorite day in the Adaptive PE program teaching Zumba. You don't want to miss the fun! Cheryl’s love of dance and music started in childhood being with her father, who taught briefly at Arthur Murray, and her mother who taught music. In 2017 she became certified as a dance fitness instructor through La Blast which was created by Louis VanAmstel of Dancing with the Stars. Cheryl and her La Blast team of Special Olympic dancers won the Gold Medal in Dance at the 2017 Winter Games in Austria. In 2018 she obtained certification as a Group Fitness Instructor through Athletic Fitness Association of America. She loves sharing dance, music, and fitness with others of all abilities. Cheryl retired from a lifelong career spent protecting human health and the environment and now focuses on health and fitness to more fully enjoy each day. Energizing musical beats and fun dance moves increase health and happiness to every cell of the body. Let’s move and groove on Mondays! Margaret Stephens loves what she does! Margaret has been working at Sequoia Hospital for over 30 years as a Respiratory Therapist, and the last 18-20 of them have been in Pulmonary Rehabilitation. She takes great delight in watching people transform as they become athletes. Most have never exercised before, or have a limited background in fitness, and they all blossom! John received his B.S. in Biology from SUNY@Stonybrook. He received his Physical Therapy degree from Daemen College. He joined Kaiser Permanente Redwood City in 2002, after working many years in private practice. Although he spent the first half of his career specializing in orthopedics and spine care, he now focuses primarily on neurologic rehabilitation, such as those who have suffered strokes, head injuries or have other neurologic conditions. He is part of a Parkinson’s Disease team at Kaiser-Permanente Redwood City that is working hard to improve care both within the facility and in the outside community. He teaches PWR! Moves™ Group classes at the Veterans Memorial Senior Center in Redwood City and pole-walking classes for people with PD, as well as his regular job as PT at Kaiser-Permanente. Katie graduated with a B.S. in biology from Emory University in 2007, and a DPT degree (three year doctorate) from Arcadia University in 2011. That same year, she joined the rehabilitation team at Kaiser Permanente in Redwood City where she specializes in neurologic physical therapy. During her time at Kaiser, Katie has completed a residency to become a clinical specialist in neurology (NCS). As a member of the Parkinson’s disease team, her volunteer work includes teaching a PWR! Moves™ Group class for those with Parkinson's disease at the Veterans Memorial Senior Center in Redwood City. Theresa graduated with her masters in physical therapy in 2008 from Nazareth College of Rochester. After working at Massachusetts General Hospital on their neurologic physical therapy team, she moved to the west coast to attend the neurologic physical therapy residency program at Kaiser Permanente Redwood City. Theresa is proud to be an ABPTS Board certified Neurologic Clinical Specialist (NCS) as less than 1% of physical therapists in the country have this qualification. She has substantial neurologic physical therapy experience in hospital, acute rehab, and outpatient settings. Her practice focuses on patients with neurologic diseases and she has a special interest in movement disorders. She also has several years experience working with orthopedic and vestibular conditions. Amelia came to us in 2005 after she retired from a career in Sales Administration and Human Resources. She is passionate about exercising and she shares her passion to help our participants. She helps to maintain our promotional materials. Wes suffered a stroke 1989. After six months of rehab he joined the Cañada Adaptive PE program. He has made significant improvements and is now volunteering with us. He keeps our weight rack clean and organized. Jeremy is our current web designer and helps us maintain our site. He enjoys illustration, sculpture and all things design. You can check out his portfolio at www.jeremysosnick.com. Debbie joined APE in 2015 after retiring from a career in Dental Healthcare. Missing her connection with seniors, she found the perfect fit!! !